Cabbage Wheel Adventure | china-land. Today I ventured into my village located across from my school. My goal was to buy the last necessities my flat is lacking. All for less than 25.00 USD. Had I gone to Walmart or somewhere similar I would have paid more than double. That’s what I love about the village. Now came the matter of taking this home. Mama told me her husband would be there shortly to make the delivery. For whatever reason I was expecting a pickup. In-the-flesh comes a scrawny on the outside muscles on the in-Chinese man on a bicycle with a barrow in tow. aka ‘Cabbage Wheel.’ Cabbage wheel comes from those ‘Cabbage Patch Kids’ big wheels made for children only these are adult size and meant to carry large loads. 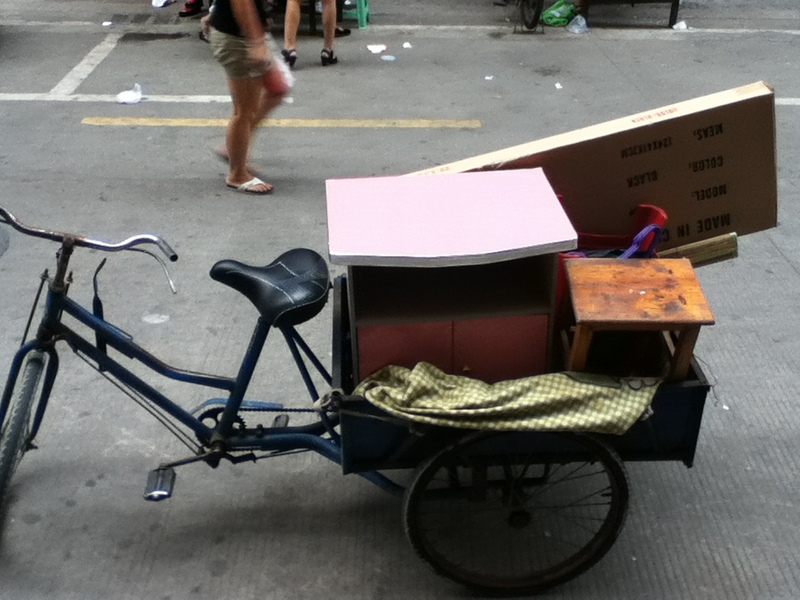 [Basically a bike or motorbike with a barrow on the back] I had no idea how Papa would be able to load all of my happy findings onto his barrow but he did & expected to load me on as well. I was to ride sidesaddle–or legs on either side bracing all the items standing up. Off we went following my cabbage wheel and newly beloved items. It was one of the scariest motorbike rides I’ve had to date. Barely slowing for anything coming our way or at us. All the while trying to keep up with the pedaling barrow boy. We made it, my motorbike savior was in awe being so close to the ocean and charged me .80 Cents for the ten blocks. Not bad. The Papa and I took all my belongings up the flight of stairs. I decided I would tip him even though it’s not expected in China. I was all but eating the ground– I was so thankful to have arrived safe and with all my new findings. My mirror was still in its box. Papa squatted in the middle of the hallway and for ten minutes assembled. Glad it was him-not me. I probably would have put it together backwards. It was incredibly kind. I was going to give him a 1.25 USD tip. As soon as he finished he said: ‘HAO LE [good/ok]..bye bye’ and in another flash, GONE. No tip. This entry was posted in Uncategorized and tagged buckets, cabbage wheel, Chinese bicycles, motorbikes, village, walmart. Bookmark the permalink.